If you’ve recently launched a startup or small business, you’re probably concerned with financing and dealing with new regulations. But have you considered whether or not you need a bring your own device (BYOD) policy? BYOD is something you may want to institute with staff, but at what cost? A BYOD policy will only work if your staff is receptive. Do your employees already own a smartphone or the required technology? Are they comfortable using it for the tasks you demand? Keep in mind that older workers tend to be less fond of new technology and the requirement to use it. Your best bet is to gauge your current workforce for their receptivity to a BYOD policy before you implement one. 2. How will you protect sensitive information? If employees use personal devices to manage confidential or proprietary company information, how will you ensure that that information is protected? And how bad could a security breach be? Here’s another question to ask yourself: What happens when employees leave? Make sure you at least include a provision in your BYOD policy outlining a remote swipe function should someone leave your organization. 3. Are you doing it to cut costs? According to a recent study by IT services provider Damovo UK, almost three-quarters of respondents claimed that instituting a BYOD policy would cause IT costs to “spiral out of control.” For example, have you factored in security costs associated with BYOD? And who will assume responsibility for the cost of employee data plans? Going with such a policy has its advantages, but it also has its downfalls – make sure to thoroughly examine both to assess the true business cost-savings of this measure. 4. Can your IT department handle it? Suppose your staff is on board with BYOD and you decide to move forward. Have you considered what will happen when your employees start experiencing glitches with their devices whether caused by company-specific tasks or not? Your IT department may be hearing from them to resolve the issues. Do you have an IT department, and are they prepared for the extra workload? Like most business decisions, determining whether to implement a BYOD policy requires a candid look at costs versus benefits. The nature of your organization, including its size, the services or products you offer, and workplace culture, are only a few of the components that need be assessed. Don’t forget to account for worst-case scenarios as well. Though a BYOD policy may look good on paper, your business must be prepared to handle the risks. 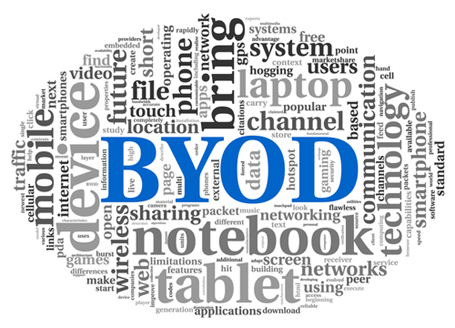 What are your thoughts on BYOD? Let us know in the comments section.